Not a huge amount today but all very exciting. The Idolm@ster anime volumes 7 and 8 came from Yesasia's sale - they were discounted so I picked up the always-questionable Gravure For You special editions - and I also received Gakuen Basara 3. 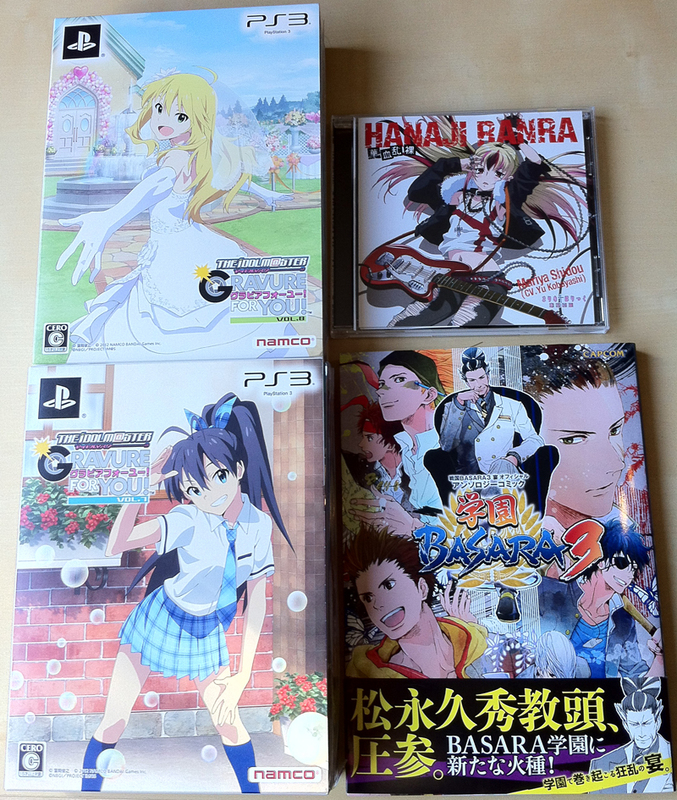 Gakuen Basara 4 was announced the other day so it must still be doing well. Last but not least is Kobayashi Yuu's HANAJI RANRA single from Maria+Holic Alive. I had originally put this on my list for Comiket 82 where it received a special early release, then found I was too physically exhausted to drag myself up to Media Factory's booth when the time came. Thankfully the CD was made widely available later on. The song itself is a furious blend of both Maria+Holic OPs with creative involvement from COOL&CREATE. This month's issue of Newtype also arrived. Yet another Gothicmade cover (I wonder if I'll ever see the actual anime). 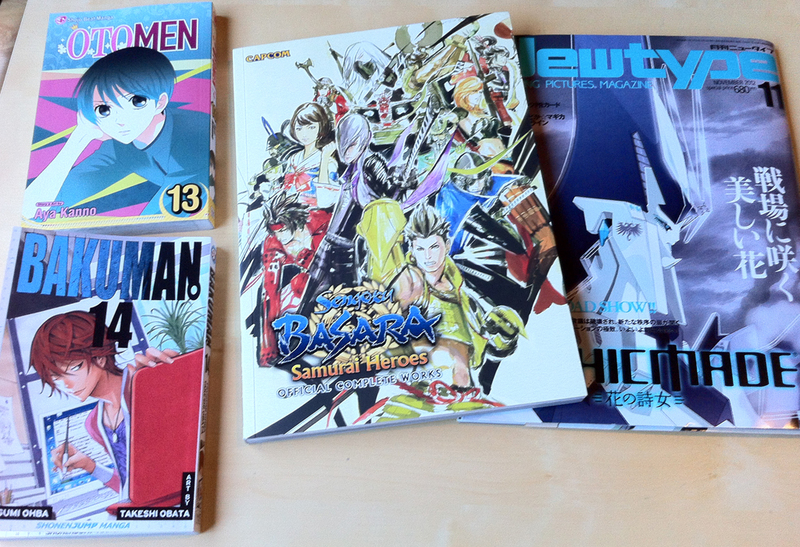 Unexpected additions to the haul came when we popped into Orbital Comics in the city. I picked up the newest volumes of Otomen and Bakuman, as well as the Sengoku Basara 3 Complete Works artbook, which has taken forever to go into general circulation after suffering long release delays. It's a little annoying how the translation inconsistently shifts between romanisation standards (i.e. Mouri/Mori, Chousokabe/Chosokabe) throughout, but it's a pretty good adaptation of the book and thankfully keeps the Japanese-centric content intact even though the English version of the game purged it all. If they'd replaced it all with comments from the dreadful dub cast I'd have cried. There are some preview pictures at the official website here. It's a very solid release and worth picking up if you're a fan of the games. Finally, I received a ransom note from Parcelforce for my last merchandise order, which has been trapped in customs for absolutely ages, so I should finally receive that on Monday, if the van arrives before work, or otherwise on Tuesday after a long trip to the delivery office.